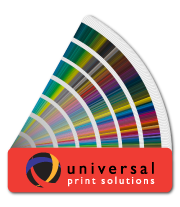 At Universal Print Solutions, we understand that you’re not just printing a brochure or designing a direct marketing campaign. That you want more than just a banner or a cheap promotional giveaway. We know that what you really want is the best way to connect with your customers, with top quality print and creative solutions that are easy, on time and within budget. That’s why we deliver what you want and need: connections, convenience…and more!